Looking under the Tools column on the report pages, you’ll notice a little pink “Files” icon. When clicked, this brings you to a page where you can view all the uploaded files from a specific registrant. The problem was that until now, it appeared active for all registrants, regardless of whether or not they had uploaded any files. Now, we’ve remedied this by only enabling for registrants who have uploaded a file, (otherwise it is greyed out). This way you can quickly scan through to see who has uploaded something and who hasn’t, without the need to drill down on each registration. That said, if you want to view a registrant’s upload(s), you can still click the icon and drill down to the details. Cool! Much like the new search function included in our latest additions to the My Files page, the View Uploads report got the same treatment. This new search function allows you to filter through your registrant uploads and only display the files/registrants that contain a specified criteria. Simply enter your search terms in the box and watch as your list transforms to only display files/registrants that match your terms. Before now, it was a bit of a chore to download or delete registrant-uploaded files, since you could only do so one-by-one. The new selective download and delete tools make this task much simpler. Notice the new checkboxes to the far left of each record – as soon as one or more is selected, you will see the Download Files and Delete Files buttons show up beside the Search box. Click the Download Files button and you’ll receive a .zip file containing all of the files that you have checked. Click the Delete Files button and, after a confirmation, you’ll remove all the files you have checked. Keep in mind that the delete action is permanent, so be careful! It’s worth noting that this section also benefits from our latest storage increase, since the space used by your registrant uploads is shared by the files you have uploaded through the My Files page. We hope you find these new enhancements as useful as we do. For more information on how to use the File Uploader field, check out our dedicated blog post on this. As always, if you have any other questions or concerns, feel free to contact us. Our latest video is now available in the Help Centre. 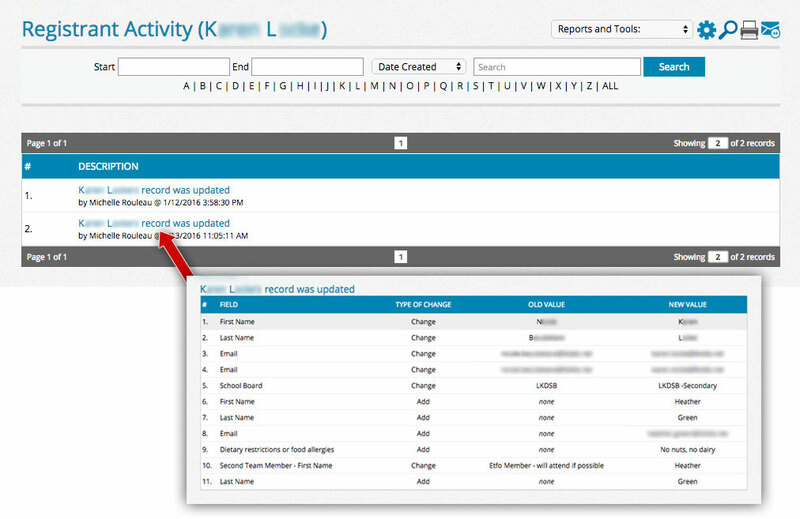 In this latest release we walk you through an overview of your event reports. These reports are available to every Event Wizard® user when you create a new form. The ability to share reports is a key feature for a lot of our users. Having the ability to send these reports to someone outside of your Event Wizard® account means you can get the right information in the right hands with little hassle. Sharing reports is quick and easy. First you will need to create a login so the person viewing the reports can do so. 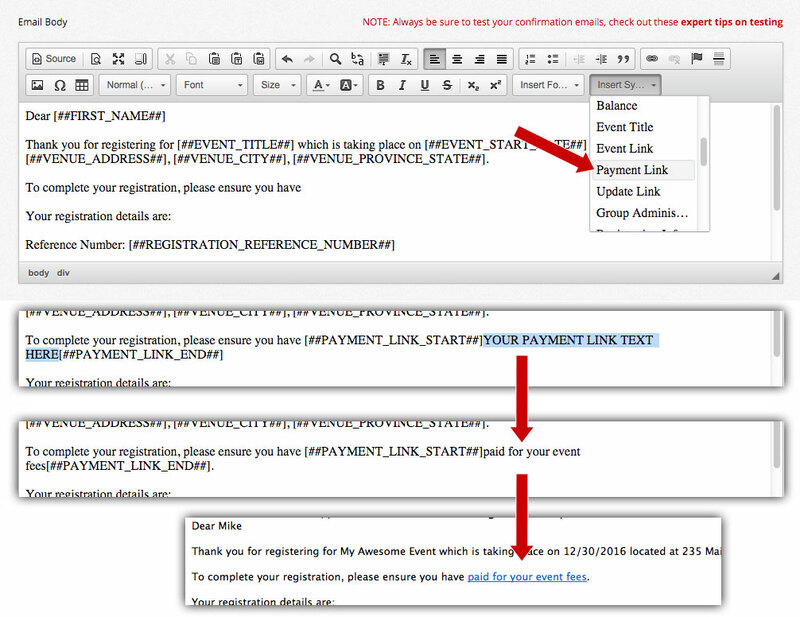 To begin adding your user, login to your event reports and scroll down to User Management. Click Add a New User then begin defining the level of access the person will have to your event reports. None – this setting will only allow access to the custom reports that you choose. Attendance Reports Only – Allows access to all pre-defined attendance reports. These are the standard event reports that are created with every form. Financial Reports Only – Allows access to only financial related reports. All Reports – Allows access to all reports. Read, Download – Read and download reports to Excel. Read, Write, Download – Read, download reports to Excel, and update attendee information. View/Create/Delete Custom Reports – User will have the ability to view, create and delete custom reports. View Custom Reports Only – User can only view custom reports. 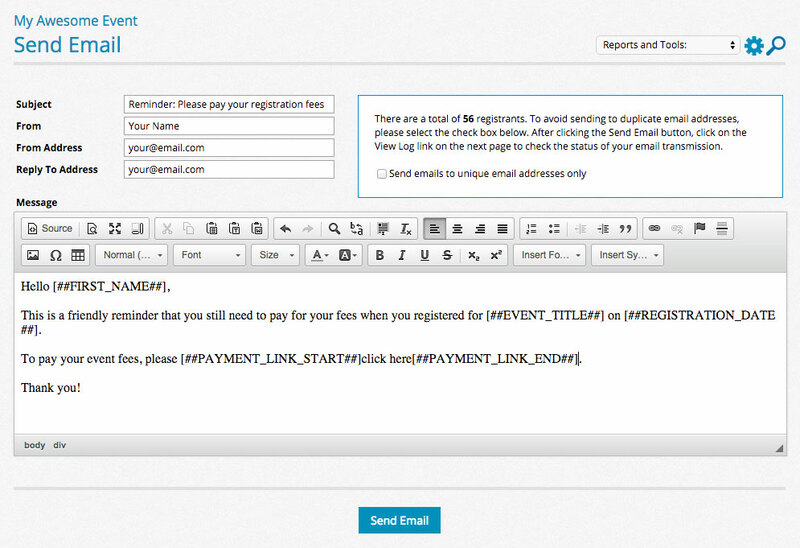 Email to Registrants – User can email registrants from the reports they have access to. For this example we will allow access to all reports. Once we have defined our user settings we’ll create a password and click Add User. Now that the new user is set-up you can send the report login page to the person along with the password that was set-up. At this point the person viewing the report can simply click the URL, enter the password and view the report at anytime. The reports will update automatically as new registrants are added to the system. If you ever need to update a user or delete them you can do so from that same User Management screen in your reports. Cancelling a registration is one of those things you don’t want to do. You want more people at your event, not less! But, for a variety of reasons registrants can’t always make it. So, how do you refund their money and cancel them from your event? Cancelling a registrant is quick and easy. 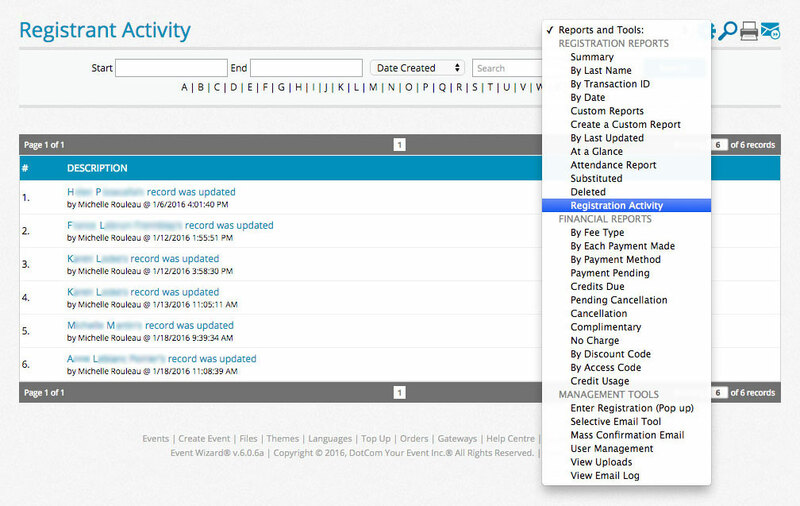 First thing you’ll need to do is login to your Event Wizard® account and view your reports. Then search for the registrant you need to cancel and click the red ‘x’ in the tools that appear to the right of their name. In the box that appears you will enter a cancellation fee if one applies. If you are using the Event Wizard® Payment Gateway (DotCom Your Event Inc.) then an automatic email has gone to our finance department. They will then refund the money less any cancellation fee you’ve retained, and update the record in your reports to ‘cancelled’. To check the status of the cancellation you can view your Pending Cancellations report. If the registrant is not located in this report then they have successfully been refunded and cancelled. If you are using your own payment gateway or Paypal you will need to login to your separate payment gateway account and issue the refund back to the registrant manually. Don’t forget to deduct any cancellation fee you have applied. If you need any assistance cancelling a registration contact us through your support ticket system and we’ll respond right away. When you purchase registration credit to run your event, it’s nice to know exactly where that credit is going. We have two accounting reports to help you track your credit usage. Credit usage in your account and credit usage for your event. This report will breakdown exactly where your credits are being consumed account wide. So, if you have three events that are live at the same time it will track all three. There is an explanation next to each transaction type in case you are unsure what they are referring to. Click through any of these transaction types and you will see an exact breakdown of how your credits are being used. This report works the same way as the Credit Usage in Your Account report, except it is for a specific event. To access this report you will login to your event’s reports and click the ‘Reports and Tools’ dropdown list. You will see Credit Usage under the Financial Reports. Select this report and you will land on a summary of registration credit used for your event. Just like you did in the Account Credit Usage Report, you can click on the transaction type to see a detailed listing of how the credits were used for this event. Both of these reports also have date and time stamps and will update in real-time, meaning each transaction that affects your registration credits will appear in these reports immediately. The credit usage in your event report will only appear for events created from November 28, 2012 onward. No historically credit data is available. If you have any questions be sure to let us know.